Drinking soft drinks: Soft drinks have emerged as one of the most significant dietary sources of tooth decay, affecting people of ALL ages, not just your children and teenagers. Soft drinks are acidic and contain citric acid, phosphoric acid and sometimes tartaric acids; these acids strongly contribute to the wearing away of the enamel, or outer layer of your tooth. The acid erosion causes the enamel to weaken, therefore making the tooth more sensitive to temperature and more prone to decay. Tip: If you are going to give your child a treat and allow them to have soda, make sure they have some water afterwards, particularly fluoridated water to remove the vestiges of the drink that can prolong exposure of the acids to the enamel. Fruit Juice: Fruit juices, specifically lemonade, limeade, orange, apple and pineapple juices tend to be highly acidic, and sometimes just as harmful as soda! These acidic juices, like soda, cause dental erosion and the research has found erosion to affect up to 80% of children. Citric Acid, which is found in sodas and highly acidic fruit juices, is one of the most common offenders. If your child is walking around with a sippy cup of fruit juice, his mouth is more acidic, creating the perfect environment for bacteria to grow and proliferate that cause cavities. Tip: Make sure the juice is 100% fruit juice and dilute it with 50-75% fluoridated water. If you are going to give your child juice, the American Academy of Pediatrics recommends children 1-6 years of age consume no more than 4-6 ounces of fruit juice per day from a cup (not a bottle or covered cup) as part of a meal or a snack. It is important to make it “part of a meal or a snack” because his mouth will already be acidic from eating. If your child is drinking juice throughout the day, his saliva never has the time to recover back to the neutral environment, creating the perfect prolonged environment for bacteria to grow and cause cavities. Water is the best thing to drink in between meals and snacks. Bedtime Feeding: Epidemiological research shows that human milk and breast-feeding of infants provide general health, nutritional, developmental, psychological, social, economic, and environmental advantages while significantly decreasing risk for a large number of acute and chronic diseases. Human breast milk is uniquely superior in providing the best possible nutrition to infants and has not been epidemiologically associated with caries. 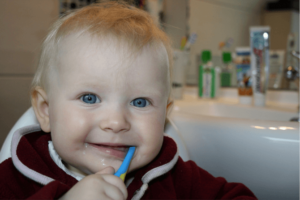 Frequent night time bottle feeding with mild is associated with, but not consistently implicated in early childhood cavities. Breastfeeding more than 7 times daily after 12 months of age is associated with increased risk of early childhood cavities. Breast milk alone is not associated with an increased risk of cavities; it is when the breast milk is combined with other foods that contribute to the increased risk of tooth decay. Tip: Breast feed your children if you can! When you start to introduce other foods besides breast milk, make sure that you are cleansing the teeth with a soft toothbrush (age appropriate in size) or a moist cloth as soon as they come into the mouth. Talk to your pediatric dentist to determine if your child is high risk for tooth decay and what kind of toothpaste (if any at all) your child should be using. Sharing foods and drinks: Cavities is a common chronic infectious transmissible disease resulting from bacteria (primarily Streptococci Mutans [fusion_builder_container hundred_percent=”yes” overflow=”visible”][fusion_builder_row][fusion_builder_column type=”1_1″ background_position=”left top” background_color=”” border_size=”” border_color=”” border_style=”solid” spacing=”yes” background_image=”” background_repeat=”no-repeat” padding=”” margin_top=”0px” margin_bottom=”0px” class=”” id=”” animation_type=”” animation_speed=”0.3″ animation_direction=”left” hide_on_mobile=”no” center_content=”no” min_height=”none”][MS]), that metabolize sugars to produce acid, which over time eats away tooth structure leading to cavities. Vertical transmission of MS from mother to infant is well documented. The higher the levels of maternal salivary MS, the greater the risk of the infant being colonized with MS leading to a higher risk of tooth decay, when the child has teeth. Along with salivary levels of MS, mother’s oral hygiene, periodontal disease, and snacking frequency are also associated with infant colonization. Reports indicate that horizontal transmission (for example, transmission between members of a group such as siblings of a similar age or children in a daycare center) also may be of concern. Tips: Dental cavities is a disease that is generally preventable. If you have had quite a few cavities in the past, try to limit sharing cups, utensils, tooth brushes, etc. and swapping spit with your child so they do not acquire your bacteria. Try to take preventive measures at an early age in order to prevent the need for later surgical intervention or the treatment of those cavities.